Have you ever wished you could fly? Or breathe underwater? Perhaps move things with your mind? Well, the little boy in this story has wished for all those and more. He also wishes rain came in seven different colours and flavours (now that could be fun! ), and that he could really talk to animals. But above all, he just wishes that something would happen. Oh wait! What's that right under his nose? Could it be something extraordinary? 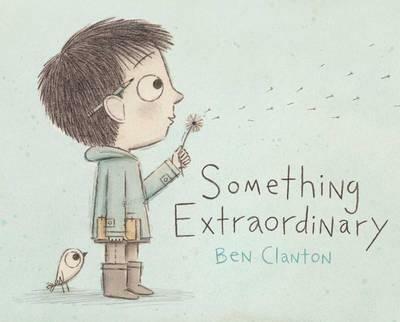 This is a whimsical exploration of one boy's quest to find the extraordinary in life. But sometimes, what you're looking for most of all can be found in the most ordinary, everyday places. In the most ordinary, everyday events. Events that, if you look at them closely, aren't really that ordinary after all. In fact, they're quite extraordinary! Don't expect bright, bold illustrations or exuberant, over-the-top text. Everything about this book is understated and simple, from the colour palette to the ending. But the result is beautiful and a quiet reminder that magic can be found all around us. We just have to look for it.